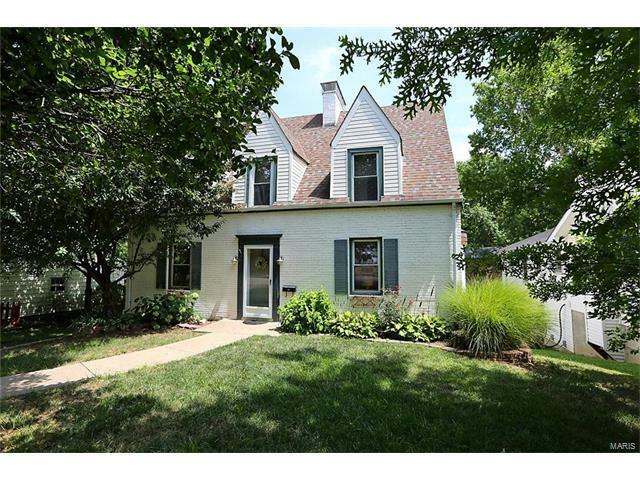 Welcome to this charming Cape Cod in the highly desirable Kirkwood School District. Nestled among the tree lined streets of Woodlawn Ave this home is full of both character and modern updates, giving you that classic Kirkwood feel. The updated kitchen boasts white cabinetry, SS appliances, wood floors, and a breakfast bar. Off the kitchen is the main floor laundry and a half bath. The spacious living room lets tons of light in with a bay window and windows flanking each side of the room and the original fireplace with its deep mantle is a standout. Upstairs the master bedroom suite has his and her walk in closets, another original fireplace, and a large master bathroom. Two addt'l bedrooms and a full bath round out the top floor. You will find only hardwood floors here! No carpet except in the part fin basement with built in book shelves and a storage area. All this just minutes away from schools/retail/parks/entertainment, many of which are within walking distance!